Located in Batesville, Miss., Batesville Tooling & Design manufactures complex injection molds for a variety of industries. For decades it had slowly been transitioning the operation from manual to commodity computer numerical controlled (CNC) machines, to improve its performance. Company personnel saw this new precision mold-making equipment as another contributor to its mission of exceeding customer expectations. When it was time to consider the purchase of high-performance machining equipment to enhance its operation, the company was hoping to obtain additional accuracy, quality and speed. Batesville purchased the Makino F5 vertical machining center to replace some of its EDM operations. Company personnel also attended technical training at Makino’s Auburn Hills, Mich., facility, in order to obtain the skills needed to help them get the most functionality out of the technologies offered by this new precision mold-making technology. The F5’s core-cooled spindle eliminates thermal growth on the machine, enabling the company to meet tolerances every time and exceed the results achieved on its previous EDM equipment. For example, on a very small mold insert, Batesville met the needed tolerances, with a mirror-like surface finish right out of the machine. Work is now completed in one setup, and cycle time has been reduced by as much as 90 percent, greatly improving delivery. This achievement has improved company profitability by as much as 30 to 50 percent. 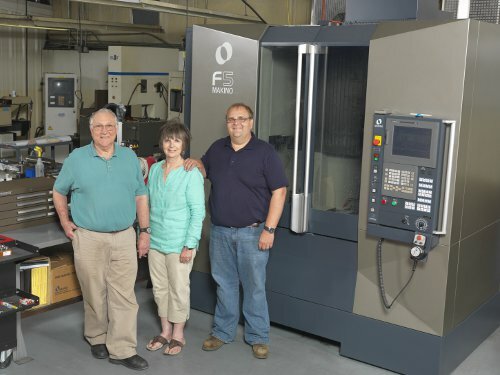 On a tiny medical-mold insert that had previously been manufactured through the EDM process, the company was able to eliminate eight hours of EDM time, completing the part in just one hour with its F5. The training that Batesville received has led to the company improving its precision mold-making requirements throughout the shop on all equipment, making it more competitive.